The Lord was named Kalva by Parvati as He overwhelmed Lakshmi speaking to Parvati on the banks of Pancha Theertham. The Lord took the form of Nindra(Standing), Erundha(sitting) and Kidanda(Sayana) postures acceding to Parvati's plea. These Sannidhis on three tiers are on Northern end of the tank at Kamakotipuram. As per purana, Shiva cursed Parvati due to some differences of opinion, and Parvati prayed and meditated on Lord Vamana at this place standing on one foot. Parvati, absolved of the curse was named Kamakkshi. Not much is known about the original Kshetra, Pushkarni etc. but one can have darshan of the Lord at the Kamakoshtipuram Kamakshi temple at Big Kancheepuram. The Perumal of this sthalam is AadhiVarahaPerumal. He is found in Standing position facing West direction. 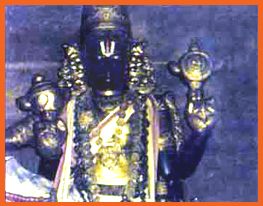 Prathyaksham for Ashvattha Naarayanan. This Divyadesam is situated inside Sri Kamakshi Amman temple in Big Kanchipuram. It is situated on the right side of the Garbagraham of Ambaal (Moolavar sannadhi).